In Israel’s fractured society – Arab vs. Jew; religious vs. secular; Ashkenazi vs. Sephardi; Left vs. Right – there is a critical need to bring people closer together. 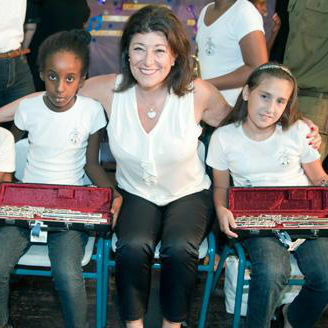 Now, a unique institute launched at TAU’s Jaime and Joan Constantiner School of Education uses the power of music to promote dialogue in Israeli society. 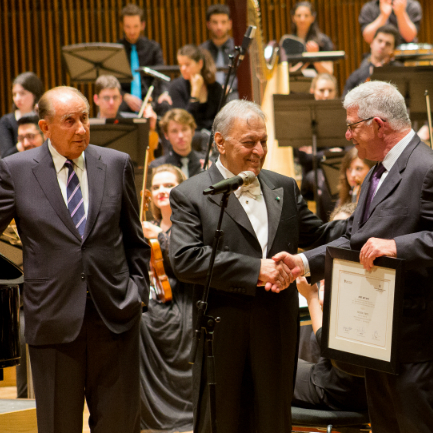 The Institute was initiated by TAU Governor and donor Aviad Meitar, and is being run by Israeli composer, conductor and educator Dr. Ori Leshman. 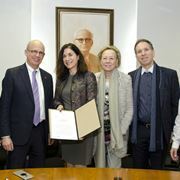 The “Music for Dialogue” (MFD method and programs were collectively pioneered by Leshman, Aviad Meitar and businessman and entrepreneur Amnon Herzig, a member of the Advisory Council of the Institute. Meitar developed a project entitled, “Music as a Tool for Conflict Resolution,” during his 2016 Fellowship at the Advanced Leadership Initiative at Harvard University. Benefiting from TAU's interdisciplinary campus culture, the new Institute combines music with education, psychology, brain studies, sociology, communication and data science. It promotes research on the influence of music, with several promising studies already enriching knowledge and contributing to a more intelligent use of music to create dialogue in a wide range of disciplines, including therapeutic ones. Additional activities include teaching; support for student ventures; conferences and workshops; grants to students with special achievements; and social projects. Leshman describes how, at student workshops, the MFD method breaks down barriers. Before their first weekly meeting, students enter songs that are most meaningful to them onto the website Pick-A-Music (www.pickamusic.com).,The site was conceived by Leshman as a social platform for sharing musical and personal experiences and facilitating the group activities that are part of the MFD in-depth process. “Then, during the workshop, something amazing happens,” says Leshman. “In no time participants begin sharing intimate personal stories with one another though they never met before.” Workshop participants often surprise one another with their musical preferences and even more so with their stories. “We can see that we mustn’t judge people. They’re much more complex than we think, as are their musical identities,” he says. Leshman is not naive enough to believe that Music for Dialogue can solve all the problems between populations that live so close to one another but rarely interact. “The idea is ‘let’s first get to know one another as human beings,’ and music is an amazing tool for that,” he says. Institute founder Aviad Meitar is a TAU alumnus in law and has an MBA from Boston University Graduate School of Management. He has been Chairman of Quadrant European Beverages Ltd., the Pepsi bottler for Bulgaria, since 2007. Mr. Meitar is married with three children. He plays the French horn with various amateur orchestras.